""O God save me--from myself,"" wrote Samuel Taylor Coleridge in 1813, lying penniless in a sweat-soaked bed in a Bath inn, poisoned by opium, his literary career and personal life in shambles. It was one of the many dark nights of the soul that Coleridge--Romantic poet, critic, philosopher and one of the greatest conversationalists in the history of the English language--was to endure during his wayward, opium-enveloped later years, a period that Holmes meticulously traces in this long-anticipated follow-up to Coleridge: Early Visons 1772-1804, which appeared in 1989. Opening as Coleridge sets out for Malta in 1804 to join the wartime Civil Service and closing as the poet ""slips into the dark"" in the Highgate estate of his final caretaker, the physician James Gillman, the book carefully traces the peregrinations, small triumphs and major tragedies that defined the second half of Coleridge's life: these included a bitter break with his oldest friend and collaborator, William Wordsworth, and the disintegration of both his marriage and his longstanding affair with Wordsworth's sister-in-law, Sara Hutchinson. Dogged by addiction, poverty and despair, accused of plagiarism, vilified by his former proteg , William Hazlitt, and damned in the public press, Coleridge nevertheless remained prolific to the end, his reputation salvaged, in part, by Shelley, Keats and Byron, who saw him as the flawed father of Romanticism. 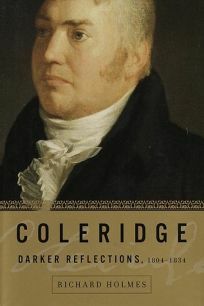 Through generous quotations and ingenious analyses of Coleridge's writing, Holmes conveys not just the minutiae of the poet's life and writing but the tone and texture of even his most informal table talk, which de Quincey once likened to ""some great river... traversing the most spacious fields of thought, by transitions the most just and logical, that it was possible to conceive."" In Holmes's majesterial chronicle, that river of words and ideas is virtually audible. 16 pages of b&w illustrations. (Apr.) FYI: Pantheon is simultaneously reprinting Coleridge: Early Visons 1772-1804 ($17 paper 432p ISBN 0-375-70540-6).